Introducing Paradoxe Corporation’s Fan Line. The true engineered solution to Transformer Cooling. Low ampere draw means a motor that is operating under less load and less electrical stress. This will prolong the motor life and insure many years of uninterrupted service. High cubic feet per minute of air delivery minimizes the stress on transformer coils and provides more cooling air during peak load times. Certified air flow results tested to AMCA Standard 230 for fan thrust. Outdoor certified & IP55 rated. 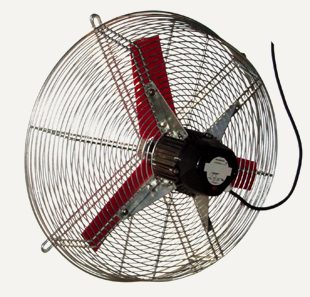 Unique, locking design between motor housing and impeller guard against moisture entry in the harshest of outdoor applications of high heat and humidity. Anodized corrosion proof aluminum motor housing and plastic impeller are corrosion resistant. Available in either 50 or 60Hz and many voltage variations for use in countries worldwide. Engineered motor and impeller combinations reduce power costs and increase optimum efficiency. Four blade sizes available — 16", 18", 24"and 27". Paradoxe can give a long warranty because we have a field tested design that is proven to work.